So glad you get to visit your sister. What do I do with C? Cook! I'm loving it because of the gluten free thing I'm finding tons of new things to try. Call! I love to talk to my friends on the phone. I like to Cycle and Climb and go Camping. Enjoy your visit with your sis! Cookie Baking Day! Which I didn't write about this time...but hey...I thought of COOKIES! ;-] So glad you get to go visit your sister! Have a great time! I love your sea cluster! Enjoy the anticipation of a promising trip. Have a great time with your sister! So what do I do that starts with the letter C? Comment! 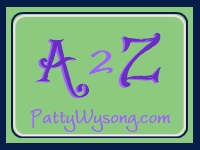 On blogs about the letter C and the other letters in the alphabet. I'm still pondering what I'll do for "D". Could it be "Donna"?